The Fifth Judicial District Commission on Judicial Performance recommends 9-0 with one member absent that Judge Karen Ann Romeo BE RETAINED. Judge Romeo is a Colorado native. She received her undergraduate degree from the University of Colorado, and her law degree from Thomas M. Cooley School of Law in Michigan. Following law school she clerked for Judge Perricone in Jefferson County, before being hired by the District Attorney's Office in the Fifth Judicial District in 1997. There she served as Chief Deputy and eventually Assistant District Attorney. She was appointed to the District Court of the Fifth Judicial District in 2008. 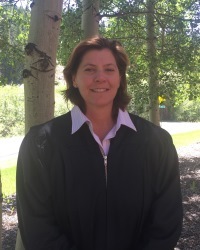 Judge Romeo hears cases primarily in Summit County, where she is actively involved in the community, participating in the Special Olympics, community dinners, blood drives and acting athletic activities such as fun runs and volunteer coaching at the high school. The Commission reviewed written evaluations of Judge Romeo from attorneys and non-attorneys, as well as a written self-evaluation completed by Judge Romeo. A personal interview of Judge Romeo was conducted by the Commission. Members of the Commission reviewed samples of Judge Romeo’s written rulings, and observed her in the courtroom during several proceedings. The Commission also conducted interviews with a representative of the Public Defender’s Office, and with the District Attorney, the Summit County Sheriff, and the Chief Judge. The 2016 Judicial Performance Survey Report regarding Judge Romeo provided feedback from 54 respondents, both attorneys and non-attorneys who have appeared in her courtroom. The survey respondents uniformly rated Judge Romeo very high overall, and above average in all areas assessed: case management, application and knowledge of law, demeanor, diligence, and communications. Of attorneys completing the survey 90% recommended to retain, and 10% not to retain. Of non-attorneys completing the survey 97% recommended to retain, and 3% expressed no opinion. Judge Romeo is held in high regard by the Commission, attorneys and non-attorneys who appear before her. She is recognized as a hard working judge who manages her docket well. She treats all those appearing before her with fairness, dignity, and respect, and is especially aware of the impact of crime on victims. Judge Romeo is particularly well regarded for her courtroom demeanor and communication skills. Judge Romeo presides over Summit County’s Recovery Court, for persons suffering from addictions. This work is very important to Judge Romeo, though challenging and emotional at times. Judge Romeo continuously strives to improve her work as a Judge, and values the feedback she receives.